Singapore is well-known as a food paradise with delectable dishes like chicken rice and char kway teow found at almost every hawker centre. Understandably, these are not what nutritionists would recommend eating on a daily basis. But if you look a bit harder, it is possible to find delicious and healthy meals on our sunny island. Check out the options below before you dig into your next bowl of laksa! This is one of the healthiest and wholesome meals that you can get at a food court or hawker centre, if you do not choose the deep fried options, that is! Select a wide range of items such as leafy or cruciferous vegetables. And do not miss out the proteins too; items such as eggs and mushrooms are usually available, and if you are lucky, you might find handmade dumplings. Go for the soup-based option, to avoid consuming too much oil and sauces which are added for the dry-based Yong Tau Foo. Sliced Fish Noodles combine your favourite noodles with fresh sliced fish and green vegetables in a delicious broth. This soupy dish is low in fat and gives you both protein and carbohydrates. Avoid the fried fish option as the oil in it will increase your calorie intake. If you are not a fan of carbohydrates, go for “sliced fish soup”, which comes without noodles. At the same time, opt for clear soup without the condensed milk as it is healthier. Originating from Hakka in China, Thunder Tea Rice is a rice bowl topped with many types of finely-chopped vegetables such as cabbage, spinach, leek, chye sim, green bean and preserved radish, as well as nuts and beancurd. It is accompanied by a bowl of “tea” which is made up of nuts, sesame seeds and a blend of herbs including basil, mint, coriander and mugwort. While its calorie count is not as low as the other dishes listed in this article, your body will thank you for the amount of good nutrients, fiber and potassium you get from this dish. Nowadays, you can opt for brown rice as most stalls provide it to give you the extra vitamins and antioxidants that your body needs. Depending on what you choose, mixed rice is a recommended dish if you want a healthier option at the hawker centre. Instead of gravy-laden dishes like chicken curry or deep-fried pork patty, select steamed fish dishes and stir-fried green vegetable to satisfy both your palate and waistline. Usually, the server will ladle thick gravy over your rice – tell him or her to skip that. 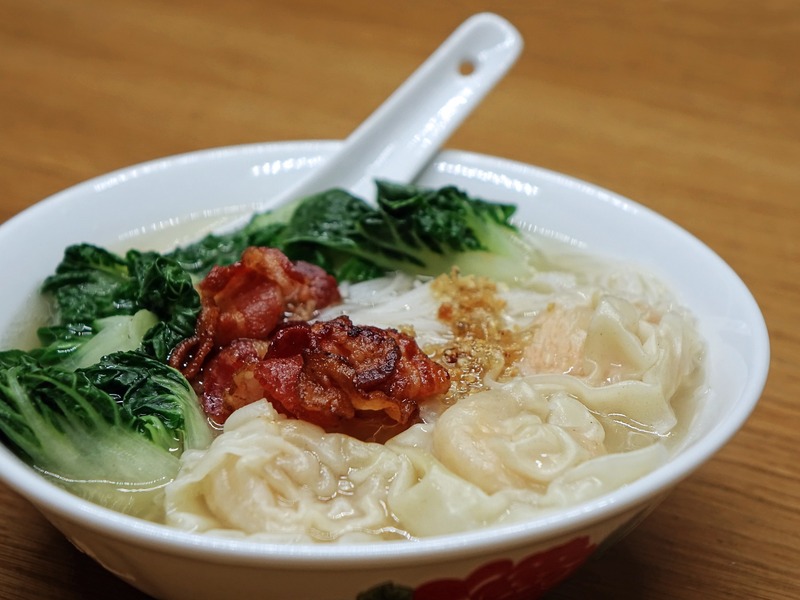 Wantons are boiled minced meat dumplings which gives you a very good dose of protein. This dish also comes with stalks of vegetables and thin noodles, served in a bowl of clear soup. You can choose to omit the noodles if you are on a low-carb diet.